Universal Training Collar Carrying Case. $17.99. This product is awesome for storing my security light baton and flashing portable single light. The foam can be removed to make room or adjusted to surround equipment to prevent damage. Case locks tight and stays shut. 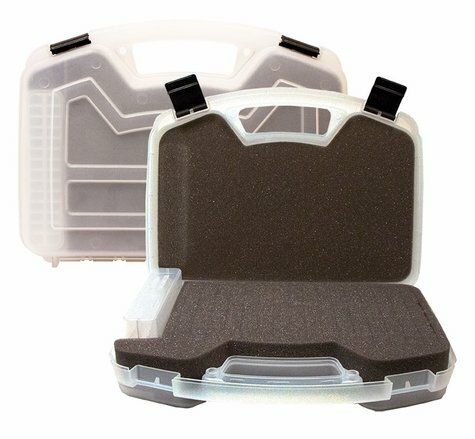 If you're looking for a great carrying case to carry almost anything that can fit inside, this is what you want to order, and it doesn't have to be for your dog. I will be definitely ordering another when needed. Thank you Gun Dog Supply! I love my universal carrying case. I can fit everything I need in it and have room for one more collar easy done with the pick pluck foam. I have a sportdog 2525 two dog collar. Thanks!! Easy to customized to my own configurations for multiple types of E-collars. I have a 2 collar system, and it is not large enough for two collars, controller, and charger. I thought it would be big enough to carry charger as well as controller and remote. It's ok. It was easy to set up, however my Sport dog 1225 does not fit in there as snug as I would like too. It would be nice if you could tear some of the foam off at an angle. I used scissors for diagonal cuts. If I were to do it again I would go with a Tri Tronics collar, there E-collars come with a custom case. Perfect for remote training collars and GPS systems that don't include hard cases. This storage and carrying case is perfect for your electronic dog collar, small handheld tracking system, GPS, two-way radios, compact cameras, etc. Perfect for Garmin Sport PRO systems, SportDOG, and other training collars without hard carry cases. Ideal for around the house, in the truck or going through airport security when traveling. The see-through lid makes it easy to verify that you have your equipment before you leave the field. Case is padlock tabbed to deter undesired openings. We also include a free battery organizer which is clear and holds up to 20 AA or 28 AAA batteries or other small parts. Inner dimensions are 12.5" x 8.1" x 3.0" Outer dim. 13.1"x 9.7"x 3.2".